Home is pleased to announce we will be exhibiting work by New Zealand born Melbourne based artist Tia Ansell in our upcoming ‘Melbourne Comes to Sydney’ show. Tia Ansell’s practice focuses on processing, assembling and following materials that exist as architectural structures and patterns. Ansell is a scavenger of sorts, she captures the proliferation of symbolic materials, architecture and iconography and then embeds these moments into her objects that create a duplicate of pre-existing assemblages positioned in the public realm. Ansell anchors these facets of contemporary life into ancient and codified traditions which play freely with techniques and materials, especially those that resonate with geodesic systems of weaving. Ansell utilises ancient anthropological modes of making and merges them with contemporary systems. She organises her parts that are weaving, painting, tiling and metal work into an assemblage to form a compositional unit arrangement. Her mode of operation involves archaeological methods of formation, collection and preservation. The objects she creates explicitly depends on its site of origin and its bounds to material consumer culture that reflect the other. Tia graduated the VCA in 2018 with a BFA (Hons). Exhibitions include ‘Evening side’ at Caves Gallery, Melbourne, 2017; Group exhibitions at Lon Gallery, Melbourne, 2018; Bus Projects, Melbourne, 2018; VCA Graduate Exhibition, Melbourne, 2017 & 2018; Hugo Mitchell Gallery, Adelaide, 2017; Margaret Lawrence Gallery, Melbourne, 2017 and Kingston Arts Centre, Melbourne, 2017. Tia exhibited with Caves Gallery at the Spring 1883 Art Fair in 2018. She has been the recipient of numerous art awards and scholarships including Majlis Travelling Scholarship (2017), National Gallery of Victoria Woman’s Association Award (2017), John Vickery Scholarship (2017), Valerie Albiston Scholarship (2017) and the National Gallery of Victoria Prize (2014). Tia has a solo exhibition at Station Gallery in March with Sam Martin and a group exhibition at Suite Gallery, Wellington, New Zealand in April. Pictured is Bundle IV, 2018, linen, cotton, silk and wool tapestry with aluminium frame. 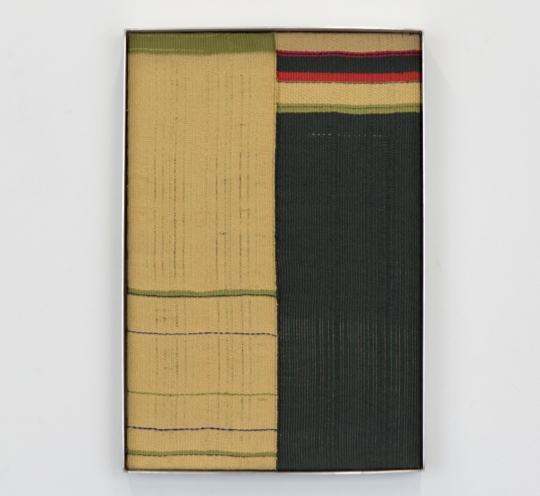 Tia Ansell, Bundle IV, 2018, linen, cotton, silk and wool tapestry with aluminium frame.